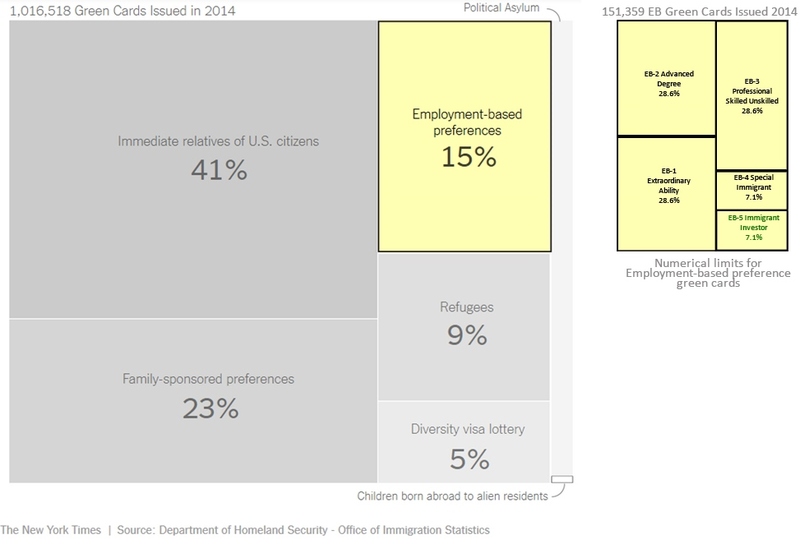 Here is a chart that visualizes how EB-5 fits into the big picture of U.S. immigration. The main chart is lifted from a New York Times article this week that discusses immigration levels. I added the box with detail on numerical limits within EB preference visas. The Government Accountability Office has another EB-5 report, this one titled Immigrant Investor Program: Proposed Project Investments in Targeted Employment Areas (September 19, 2016). The report is addressed to Senators Grassley and Leahy and Representatives Goodlatte and Conyers, and responds to their request for information on EB-5 projects in recent I-526 petitions, specifically “(1) proportion of petitioners that did or did not elect to invest in a TEA; (2) proportion of petitioners basing a high unemployment TEA on various types of geographic areas; and (3) EB-5 investment as a proportion of the total investment in petitioners’ TEA projects.” GAO answers these questions with statistics from a random sample of 200 I-526 petitions filed in FY2015 Q4. The report will interesting for people who don’t already know where most EB-5 money goes, in terms of geography and industry, and how EB-5 normally fits into a project’s capital stack. The report is a gift to journalists itching to write a headline with “gerrymandering” in the title (though it also indicates that the majority of combined-census-area TEAs are actually quite small areas, comprising fewer than 11 tracts). I’ve gathered that Grassley et. al.’s ideal EB-5 project is a business with no non-immigrant funding in a thoroughly blighted Midwestern town, and the GAO report reflects the fact that indeed few EB-5 petitioners have chosen such projects. Of course TEA incentives are only one factor in this reality. Market factors also determine the kind of project that entrepreneurs are willing to undertake and investors are willing to fund. But the GAO report will inform the talks on EB-5 legislation that need to resume before December 9. The regional center program has been reauthorized through December 9, 2016 as part of the Continuing Appropriations and Military Construction, Veterans Affairs, and Related Agencies Appropriations Act, 2017, and Zika Response and Preparedness Act signed today by the President. I held off on reporting this because I couldn’t find RC program reauthorization in the bill. But IIUSA assures me that they’ve gotten confirmation from multiple Congressional offices that RC program extension is in Division C (p. 125-127), so we’ll go with it. (UPDATE: If you’d like the detail, here are emails I received from a couple kind attorneys who explain how the language works. See also the article Congressional Research Service Analyzes Validity of EB-5 Program Extension.) The extension gives only a very short reprieve. Lawmakers are now leaving Washington and won’t be back until November 14, leaving just a few weeks to figure out what comes next — or (probably more likely) to redeploy short-term measures to defer substantial lawmaking to the next Congress. For reference, I’ve compiled a timeline of regional center program legislation to date. Notice the varying authorization periods, the fact that new legislation has usually been finalized nearly on and sometimes after the sunset date, that RC program extension has usually been part of appropriations legislation, and that previous program extensions have been associated with few to no program changes. To be continued…. (Note that Googling the PL number will readily bring up the legislation, and in most cases you can locate the RC program reference in the document by searching for 610(b).) We hope that the regional center EB-5 will eventually have the stability of a permanent program. I’ve been updating my post Looking toward RC program reauthorization as significant developments come to my attention. I’ll make a new post when the text of new legislation is released. The days between now and September 30 will be interesting. At least the regional center program is less controversial than the Zika virus, so far. 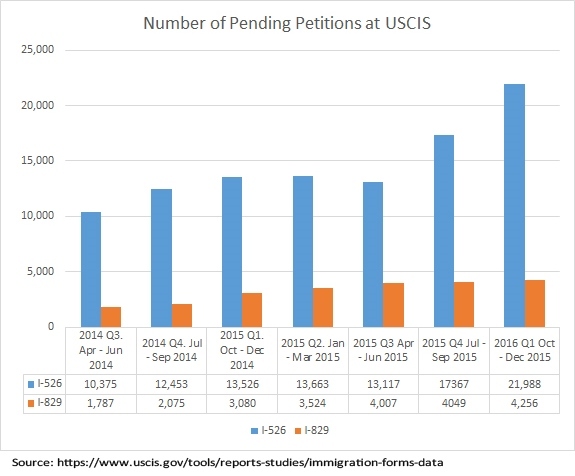 The USCIS Immigration and Citizenship Data page now has EB-5 petition statistics for the third quarter of fiscal year 2016. IPO processed fewer petitions overall in Q3 than in Q2 2016. I-526 receipts were slightly up from Q2, but still relatively low, and IPO processed more I-526s than it received in Q3. An unusually large number of I-829 petitions were denied in Q3. The backlog remains dire. 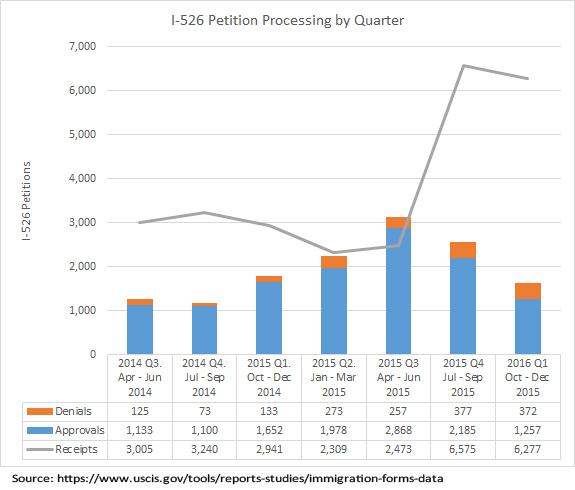 My charts summarize data for I-526 and I-829 receipts, approvals, denials, and pending petitions from the USCIS reports. I also added bonus charts estimating the amount of investment and number of immigrants associated with petitions filed since 6/1/2015 (to help visualize the impact of retroactive rule changes, and why we don’t want them), and showing IPO staffing levels as reported by Mr. Colucci in EB-5 stakeholder meetings (since staff increases have been a major strategy for tackling the petition backlog) and recent processing time reports. The Fraud Detection and National Security (FDNS) unit has grown to 25 FTE staff, and IPO has created a specialized group focused on regulatory compliance. FDNS is using overseas staff to attempt to identify potential sources of fraud stemming from any false statements by immigrant investors regarding their source of funds. FDNS has planned at least 50 site visits in four states, and anticipates conducting additional site visits on a continual and as-needed basis. The first site visits began in August 2016. FDNS has conducted risk assessments, and identified securities fraud as the most frequent source of fraud in the program. USCIS has updated I-526 and I-829 forms to help capture additional information about petitioners and applicants that could be used to potentially identify fraud. USCIS conducts selected background checks on all of its immigrant investors and regional-center principals, in cooperation with partners such as the Federal Bureau of Investigation and U.S. Customs and Border Protection. USCIS recently signed a memorandum of understanding with the Financial Crimes Enforcement Network (FinCEN) and anticipates conducting additional reviews to help identify potential fraudulent actors and fraudulent financial activity in its regional centers. USCIS is developing standard operating procedures for adjudication staff for each investor form, and hopes to finalize these procedures by Q1 of FY2017. GAO found that USCIS continues to be hindered by a reliance on time-consuming reviews of paper files that preclude certain potential fraud-detection activities such as the use of text analytics to help identify indicators of potential fraud. The continuation of planned efforts to digitize the files, including the supporting evidence submitted by applicants and petitioners, could help USCIS better identify fraud indicators in the program. 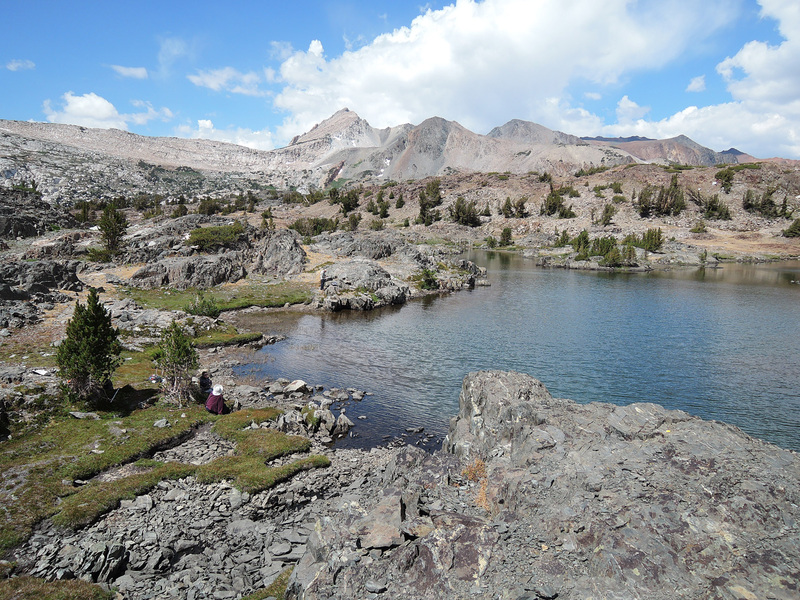 EB-5 World kept busy during my annual wilderness week, so this post is a long one. Before I get into detail, here are a few headlines: No new EB-5 policy or guidance likely this year, IPO steps up scrutiny of parties involved in regional centers and emphasizes due diligence responsibilities, Minors face challenges in qualifying as EB-5 petitioners, Wyoming gets its first regional center. USCIS hosted an EB-5 stakeholder teleconference on 8/29/2016 – ostensibly to review content that we couldn’t hear in the 7/28 engagement, but stakeholders wisely took the opportunity to ask new questions. Nicholas Colucci and Julia Harrison made new statements supplementing the prepared remarks for the 7/28 engagement. IIUSA has shared a recording with members. I was not able to record the event, but have summarized highlights for you. USCIS Timeline for New Policy and Regulations: USCIS expects to finalize the EB-5 chapters for the USCIS Policy Manual by the end of this fiscal year or at least calendar year, and to hold off on releasing new policy and guidance until after those foundational chapters on existing policy have been published. Mr. Colucci described the policy manual as “a compendium of all existing policy of the EB-5 program, putting it all into a single document. As we draft new guidance with respect to the EB-5 program, what we will do is generally put it out for notice and comment and then finalize it in that manual. So it will be a document that gets added to as it goes along.” It will be nice to have existing policy gathered in one place, but what we really want is new policy. In her statement for the 7/28 meeting, Lori Mackenzie promised that “Among the topics we hope to further expand upon are issues associated with the requirements for job creation and investment sustainment that apply to EB-5 investors and the impact of misappropriation of funds on those requirements.” But for now, Mr. Colucci and Ms. Harrison declined to make statements about sustaining investment or dealing with investors following regional center termination, saying that these points would wait to be covered in future policy manual amendments, after the foundational content is completed (ie after this year). The draft Guidance on the Job Creation Requirement and Sustainment of the Investment for EB-5 Adjudication of Form I-526 and Form I-829 (first posted for comment in August 2015, and urgently needed) is now off the table until it can be issued in revised form for comment as a policy manual amendment. Regarding revised regulations, Mr. Colucci said “We are working on an EB-5 regulation. We don’t have a timeline for the publication of that regulation, but we continue to actively work on it.” He did not say anything about a November 2016 target (mentioned last month by DHS Secretary Jeh Johnson). I-924 Requests for Clarification (RFC): Mr. Colucci pointed out that IPO has been issuing a number of RFCs to regional center applicants who did not respond completely to Form I-924 Part III(D), which asks for a list of principles, agents, individuals and entities that are involved in the management, oversight, and administration of the regional center. “What we’ve been finding is oftentimes this is left blank when the form is submitted. But as we review the supporting documentation, we see in fact a number of other names that should’ve been included in this section. What we’re doing as part of this Request for Clarification is determining whether other individuals are involved with the regional center, and if so, we’re seeking their identifying information.” I think we can assume that USCIS wants that complete list and identifying information for broader vetting and accountability – perhaps proactively implementing reform proposals from reauthorization bills that Congress hasn’t managed to pass yet. Customer Service Issues: Mr. Colucci stated that IPO would not respond to duplicate requests sent to the Customer Service Mailbox within 15 days of the original request, but reminded people of the escalation process. (See the EB-5 Customer Support page.) USCIS.gov has added a Chinese translation of the support page, and a FAQ page addressing common questions from investors. In response to Q&A, USCIS invited people to use the customer service mailbox to notify USCIS of factual errors in an RFE or NOID notice, and said that USCIS may issue a replacement notice. Minors as EB-5 Investors: Julia Harrison responded to questions about minors under the age of 14 being able to invest in the EB-5 program. She said “Just to clarify, for USCIS the statute and regulations don’t have an age limitation. However, it is important to understand that a minor normally lacks the legal capacity to enter into the various types of contracts that are necessary to demonstrate the qualifying investment. So, while the eligibility for any minor to enter into the contract would depend on the specific facts of the particular case, it could be difficult for them to be the principle petitioner because of the concerns related to their capacity to contract and the presumptive voidability of contracts signed by minors. When a minor does enter into a contract, the petitioner bears the burden of demonstrating via preponderance of the evidence that the minor or legal guardian who enters into this agreement on their behalf will be – that it will be binding on the minor petitioner in the relevant jurisdiction. And again that’s up to the petitioner to demonstrate that evidence when they submit their application to USCIS. For a child less than 14 years old, a parent or legal guardian may sign on their behalf, but you also need to be prepared to demonstrate, with evidentiary requirements, proof of the parent-child relationship.” In response to questions, Ms. Harrison suggested that it might be acceptable for parents to transfer investment on behalf of a minor child, so long as it’s clear that the capital belongs to the minor petitioner, not the parent. She further stated that IPO was not in a position to specify the nature of proof required to overcome a presumption of voidability, or even to give general guidance, but would adjudicate on a case-by-case basis. I wonder if Ms. Harrison was basically saying: IPO currently does not see how it’s practically possible for a minor to be an EB-5 petitioner, but is open to being convinced otherwise. Catherine DeBono Holmes has written articles Using the Uniform Transfers to Minors Act for Minor Investors in EB-5 Investment Funds (September 23, 2016) and Suggested Procedures and Possible Options for Accepting Minors as Investors in EB-5 Investment Funds (June 23, 2016). 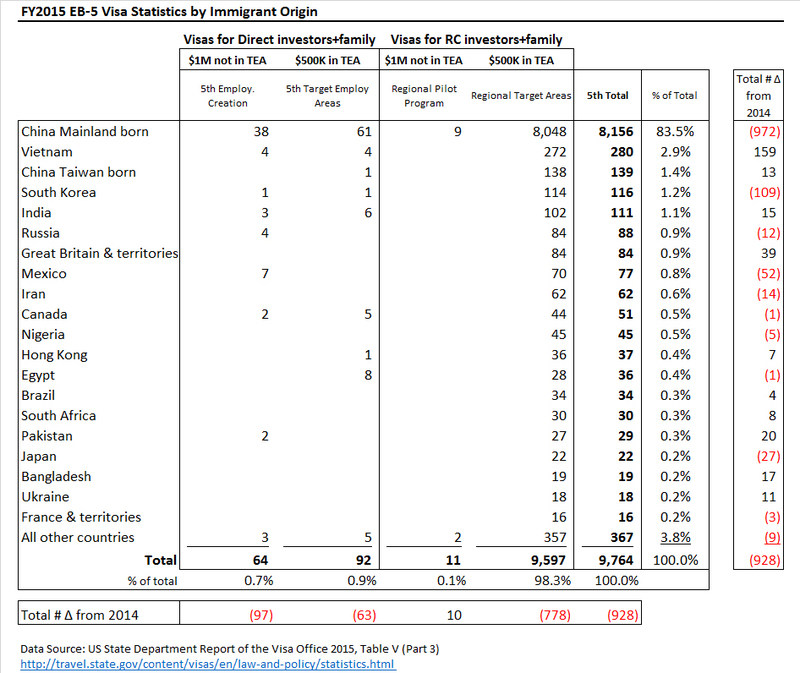 See also blog posts by Klasko Law and Wolfsdorf Rosenthal on minors as primary EB-5 applicants. These articles take a positive approach, but note that I’ve heard other prominent EB-5 lawyers express strong questions and reservations about the practicalities of minors as EB-5 petitioners. The Rent-a-Center model: I’ll quote this from Mr. Colucci’s published remarks for the 7/28 engagement, since it seems to be a warning shot: “To uphold the integrity of the program, USCIS is focused on ensuring that regional centers exercise due diligence in the oversight of the capital investment and job-creating projects they sponsor. As the program has become more popular, the paradigm of regional center relationships has expanded. But let me remind everyone in the EB-5 community that due diligence, monitoring and oversight are the obligations of the designated regional center entity, and central to the integrity of the program. When we become aware of any threats to the integrity of the program, we seek to take corrective action.” IPO appears to be giving notice that they don’t like a hands-off regional center relationship. Regional centers that use a “rent-a-center” model, licensing third parties to use their designation for projects, should take note and take care to implement sufficient due diligence, monitoring and oversight. Other Points: The teleconference was unusually rich in good questions that solicited new answers – though the answers are marginally bankable since they’re just off-the-cuff in context of a call. But for what it’s worth, I heard: Yes, the first I-526 in a pooled direct investment case establishes deference for subsequent I-526s (and USCIS is considering process adjustments that will make this more workable in the direct context); Yes, IPO accepts a loan secured by equity investment in the petitioner’s own business as an acceptable source of funds (but note a different story in the Ibrahim case being litigated, Ed. ); No, USCIS does not defer to previous source of funds determinations, but only to the items listed in the Policy Memo deference policy; No, USCIS does not necessarily require proof of non-EB-5 funding already in the bank but looks for general preponderance of evidence (e.g. things like letters of commitment and term sheets); Yes, it should be sufficient to sustain an investment during the 2-year conditional residence period (implying that the investment need not also be sustained during the period when I-829 is pending); No, I-526 petition processing is not exactly FIFO but happens in a range that’s pegged to when IPO received the first I-526 for that project; No, IPO is not considering new policy to implement the Child Protection Act (and specifically, declines to hold I-526s in abeyance to add time in order to help protect child eligibility); No, IPO does not think that CPA practices for I-130 family-based petitions can be applicable for EB-5. AAO continues to dismiss appeals of USCIS denials of I-526 cases. Here are the most recent issues. Investors in Terminated Regional Center: AUG032016_01B7203 through AUG042016_04B7203 represent six additional petitioners in the same position as the JUL182016_01B7203 case. All these investors were in the stage between I-526 approval and receiving conditional permanent residence (CPR) when their regional center was terminated. All had their I-526 approvals revoked, with identical justifications based on the policy prohibiting material change during the period between I-526 approval and green card. AAO agreed with USCIS in these cases. I hear through the grapevine that USCIS has gone further and revoked CPR for investors who were further in the process when their regional center was terminated – a very serious development, if the rumor proves to be true and to represent general practice. Material change policy wouldn’t justify such revocations, but we may not be able to discover USCIS’s practices and justifications until we see decisions on investor appeals. In yesterday’s conference call, IPO said they “don’t have guidance yet” for how investors are treated in the event of RC closure – but obviously they do, since they’re busy sending out notices of intent to deny and revoke to some investors, and apparently just unwilling to publicly disclose the current logic guiding their actions. Do people at IPO not care about their own job security, at least? How much adversity and uncertainty do they think the EB-5 program and investors can take, and still be there to provide the “investor program” in “investor program office”? Please, give us some transparency! Regional Center Program Reauthorization: A group of securities attorneys got together and redlined proposed legislation with comments and corrections from a securities perspective, and have submitted the document to Congress. You can read the EB5 Securities Roundtable suggestions here. With so many arguable points in last years’ proposals, it’s hard to imagine Congress finalizing anything substantial in the next couple weeks, but we’ll take a deep breath and see what happens. We’re now just days away from September 30, the next deadline for Congress to reauthorize the regional center program. International Entrepreneur Rule: USCIS is proposing a new International Entrepreneur Rule which would allow certain international entrepreneurs to be considered for parole (temporary permission to be in the United States) to start or scale a U.S. businesses. This rule is quite unlike EB-5 and not related to EB-5, but – if implemented – could provide a narrow alternate path to U.S. residence for foreign entrepreneurs. Michele Franchett of Stone Grzegorek Gonzalez has a helpful summary, and Ron Klasko comments on the rule’s (non)relevance for EB-5 investors. Sanctions for Brokering EB-5 Investment: Three Immigration Lawyers Sanctioned by the SEC for Brokering EB-5 Investments (August 24, 2016) discusses how and why the SEC is making examples of immigration lawyers who appeared to receive transaction-based compensation in connection with recommending a regional center or assisting in purchase of an EB-5 limited partnership interest. The most recent cases involved minor violations and relatively little money, but the SEC perceives immigration lawyers as gatekeepers for EB-5 and is going after them accordingly. NASAA EB-5 Investor Advisory: The North American Securities Administrators Association has published an investor advisory for potential investors in EB-5 projects. The notice provides a due diligence checklist that’s handy for investors, and also for people who think about how to structure and write up proposals that will satisfy investor questions and concerns. Senator Grassley to Secretary Johnson: You and I have had a few discussions about the EB-5 program and I thank you. At least two occasions we’ve had long discussions about that, so thank you. I know you share my concerns about the program. I appreciate the fact that you are working to issue regulations that mirror reforms that Chairman Goodlatte, Senator Leahy, Congressman Conyers, and I have been pushing. Will the regulations you planned roll out soon, and finally do away with gerrymandering to prevent regional centers from using an unlimited number of census tracts to build in affluent areas even though they are not high unemployment areas as the law envisions? Secretary Johnson: Limiting gerrymandering was one of the changes that we are developing, consistent with your recommendations, sir. And as I think we discussed the other day, we intend to put these changes out for notice and comment, I think in November – as soon as November. That is on the list, yes sir. That “I think” and “as soon as” don’t sound very confident, but it’s nice to see a possible date mentioned. 01/11/2017 Update: USCIS published an Advance Notice of Proposed Rulemaking “EB-5 Immigrant Investor Regional Center Program” (Docket No. USCIS-2016-0008) and Notice of Proposed Rule-making EB-5 Investor Program Modernization (DHS Docket No. USCIS 2016-0006). I’ll be interested to see whether any TEA critics take the industry’s proposed compromise seriously. Can we count on Senator Grassley to be so focused on gerrymandering that he’ll be satisfied with concessions on that point and overlook the other part of the TEA incentive equation? Will he be impressed by IIUSA’s map of sites that would be privileged under its virtuously restrictive proposed TEA parameters, and not consider that definitions are irrelevant if investment levels erode the advantage of being a TEA? (IIUSA leadership suggests $700,000 for non TEAs $600,000 for TEAs which would narrow the gap to insignificance and also – accounting for inflation — make both TEA and non-TEA investments cheaper than they were in 1990, when the $1,000,000/$500,000 thresholds were set.) If there has to be change at all, the industry proposal is the kind of change that successful regional centers and EB-5 investors would naturally like to see. Joseph Whalen has pointed out a job posting on USAJobs.gov that provides insight into what USCIS plans for its regional center auditors to do. IPO is looking to hire people with accounting, business, and legal background and experience to “conduct audits of regional centers and associated entities; provide written reports to support an agency action/adjudication; and utilize audit findings to conduct statistical analysis to develop risk mitigation strategies.” The listed duties focus on financial auditing and analysis of financial documentation. I’m late in commenting on this year’s first AAO decision on an I-924 application (APR282016_01K1610 Matter of A-C-R-C-, LLC), but the case is worth reviewing for people interested in regional center application content requirements. The case discusses a regional center application based on actual and hypothetical projects, and addresses several points of ambiguity: (1) How much evidence is needed to qualify an actual project in a regional center application? (2) If an actual project plan has deficiencies, can it be modified to cure the deficiencies or removed from the application without triggering a material change problem? (3) If a hypothetical plan has deficiencies, can it still form a basis for approving a regional center application? In denying the application, USCIS apparently gave or implied the following answers (1) a lot (including evidence such as feasibility study, market study, and research citations); (2) no; (3) yes. In reviewing the appeal, the AAO sends the case back to USCIS to further explain or revisit its determinations. I’m particularly interested in the hypothetical plan issue. In Matter of A-C-R-C-, LLC, USCIS identified a few deficiencies in the hypothetical business plan and economic analysis (specifically in the data cited and in the estimated timeline), but then sidelines these deficiencies as irrelevant, since the hypothetical projects would not be receiving deference anyway. But can the quality of hypothetical analysis be disregarded, if a regional center can be designated based on hypothetical projects? (In 2014, 65% of initial I-924 approvals were based on hypothetical projects only, and I expect to find the 2015/2016 average even higher.) I hope that USCIS rethinks this issue in forthcoming policy/regulations, because the EB-5 community does not benefit from a flood of new regional centers that were not necessarily required to present reasonable and credible proposals for how they might deploy EB-5 investment. We don’t want the bad old days of requiring all I-924 projects to be so-called shovel-ready (that’s not realistic considering year+ processing times, and not in line with the base requirement for regional center applications to present “a general proposal, for the promotion of economic growth”). But even projects in the hypothetical planning stage can and should be held to standards of credibility and reasonableness, and have a bar higher than that set in the May 2013 EB-5 Policy Memo (which defined “hypothetical” simply as “a project proposal that is not supported by a Matter of Ho compliant business plan.”). I think of Pacific Proton Therapy Regional Center, which was initially designated in 2012 based on a hypothetical plan. Four years later the SEC is bringing charges, having discovered that the principals raised and spent quite a bit of money while their project never did become any more than hypothetical. Perhaps USCIS should have pressed for more evidence upfront that the applicants really had the connections and resources and a viable game plan to make their ambitious project possible to realize. For those who like to see processing time case studies, here is the history for Matter of A-C-R-C-, LLC: Form I-924 filed in July 2013, USCIS issues RFE in July 2014, applicant responds to RFE in October 2014, USCIS issues notice of intent to deny in April 2015, applicant responds to NOID in May 2015, USCIS denies application in August 2015, AAO remands application to USCIS in April 2016. Additions to the USCIS Regional Center List, 06/10/2016 to 07/05/2016. The entire rulemaking process could theoretically happen within a year, and there’s been plenty of talk about its urgency, but I’m not holding my breath. For context, the regulation dealing with EB-5 petitions approved 1995-1998 (RIN 1615-AA90) has appeared as a proposed rule the OMB agenda biannually since 2003, the proposed regulatory language was finally published in the October 2011 Federal Register, the public comment period was completed in November 2011, and the rule entered the final stage March 2015. It remains to be seen whether the promised new EB-5 regulations can be promulgated in less than thirteen years. We’ve heard since 2014 that USCIS is actively working on them, so two years down, at any rate. How close are we to getting new legislation that affects EB-5? The tidbits and rumors I hear suggest (1) that we’re unlikely to see a substantial reform/reauthorization bill before September 30, considering the few Congressional workdays left and the election, (2) that substantial reform legislation is still in active discussion (Grassley and Leahy staffers met just last week with securities attorneys to discuss a forthcoming edition of the S.1501), (3) that the regional center program will probably get another clean short-term extension beyond September 30, 2016, to give more time for substantial legislation, and (4) that the next short-term extension is likely to be genuinely short, considering that the leaders motivated to insist on urgent program changes have even more ammunition and motivation than they did last year. The House has a couple new bills with some relevance to EB-5. H.R.5203 – Visa Integrity and Security Act of 2016 would tweak the application and review process for all visa categories (not EB-5-specific, but could affect some EB-5 investors). The EB-5 Insights blog has a summary of key provisions, if you’re interested but don’t want to read the bill. H.R. 5398: Immigration for a Competitive America Act of 2016 doesn’t mention EB-5 but proposes to increase the total number of employment-based visas from 140,000 to 253,000 (+81%), which would effectively increase the EB-5 visa allocation by 81% as well. As of now the bills haven’t gotten far and GovTrack rates them at 0%-3% chance of being enacted, but FYI the proposals are out there. MAY032016_01B7203: Direct EB-5 case in which the petitioner purchased two gas stations through bankruptcy court following the previous owner’s Chapter 11 bankruptcy liquidation, reopened them under his new company, and claimed this as creation of a new business with new job creation. USCIS/AAO declined to credit the business or jobs involved as “new” despite purchase from bankruptcy, because the purchase documents did not unambiguously show that the business was non-operational prior to sale, and that the petitioner merely purchased assets, not a business. MAY032016_02B7203: Direct EB-5 case in which the petitioner invested in a business (house-flipping) that by its nature would be unlikely create the required number of jobs, submitted a business plan that naturally didn’t make a good job creation case, paid EB-5 document and legal fees from the enterprise, and had a messy expenditure paper trail that didn’t clarify that the costs attributed to the enterprise were actually billed to and paid by the enterprise. MAY052016_01B7203: In which a petitioner attempts to overcome a finding of fraud by claiming that she didn’t willfully misrepresent material facts because she didn’t know about the material facts filed with her petition. The AAO maintained that her stated ignorance related to filings is not reasonable, and supports a finding of deliberate avoidance. MAY102016_01B7203: In this direct EB-5 case, the business plan is judged non-credible based, as usual, on inconsistencies: in this case, inconsistencies between the business plan and how the business subsequently developed. MAY102016_02B7203: This direct EB-5 petitioner did not demonstrate that he was eligible at the time of initial I-526 filing, but committed material change when he filed a revised Form 1-526 that changed the NCE’s name and location and materially altered its industry focus, among other changes. Additions to the USCIS Regional Center List, 05/03/2016 to 05/23/2016. In commenting, consider DHS’s attempt to analyze regional center revenue sources and the potential impact of the proposed I-924 fee increase (page 99-101). USCIS is committed to strengthening and improving the overall administration of the EB-5 Program. The EB-5 Program encompasses Forms I-526, I-829, I-924, and I-924A. The cost baseline includes $16.0 million in FY 2016 and $15.9 million in FY 2017 for additional staff that would comprise a specialized team of forensic auditors, compliance officers, and other staff, whose primary focus would be to ensure regulatory compliance. This would directly contribute to the integrity of the program by providing the USCIS Investor Program Office with employees who have specialized knowledge required to adjudicate these benefits. In addition to enhanced staffing, USCIS would make additional IT systems investments to make case processing more efficient. USCIS would add $1.7 million in FY 2016 and $1.8 million in FY 2017 to improve the case management system and further develop its risk management strategy to ensure program compliance. Additions to the USCIS Regional Center List, 04/25/2016 to 05/03/2016. Next Monday 4/25 USCIS will hold an EB-5 listening session to give stakeholders a chance “to provide feedback on potential EB-5 regulatory and other policy changes.” This week USCIS emailed “a list of topics that we would like your input on,” as follows: “Minimum investment amounts; The TEA designation process; The regional center designation process, including, but not limited to, the exemplar process and the designation of the geographic scope of a regional center; and Indirect job creation methodologies.” This list gives us an interesting tip of the hand on the areas USCIS plans to address in forthcoming revised regulations and new policy. So what are the potential changes? I’ve summarized issues and proposals that are on the table in these four categories, with special reference to Secretary Jeh Johnson’s legislative wish list as expressed in his April 2015 letter to Senators Grassley and Leahy, and provisions that have been included in EB-5 reform bills. All these items were put on the table for Congressional action, and I’m not entirely clear about how much USCIS has power to change through regulation and policy, absent legislation. And I don’t hold my breath for USCIS much more than for Congress to get things done. But I hope to hear more on Monday about what USCIS has in the pipeline, and this list may help spur your thinking on feedback you’d like to give during the meeting. — In an IIUSA member poll, 72% thought raising the TEA level to $800K workable for their business; 15% thought the $2M/$1M level workable. — Judiciary committee hearings have all mentioned the need to raise investment amounts. The Senate TEA hearing discussed Congressional intent for the base amount to be the norm and TEA investment an exception to incentivize a limited number of projects. — In an IIUSA poll, 59% percent thought the 12-census tract California model viable for the industry, 36% thought the NMTC-modeled category could work. — Judiciary committee hearings have expressed strong and divisive opinions about what types of projects should be incentivized and which type of geographic areas privileged, what types of incentives would be effective, and who should designate TEAs. — Some interesting analysis has been done on the potential impact of TEA change proposals, including by Friedland & Calderon. — Most 2015 bills include a provision requiring exemplar I-526 filing for project pre-approval, and include a provision prohibiting foreign RC ownership. — I haven’t noticed other people talking about regional center geographic scope as a sensitive issue, and interested to see this point raised now. I’ve been remarking since late 2013 on the many multi-state regional centers getting designated, and wondering what IPO thinks “regional center” means. The law establishing the program specifies that “a Regional Center shall have jurisdiction over a limited geographic area, which shall be consistent with the purpose of concentrating pooled investment in defined economic zones” (Section 610(a) of the Departments of Justice and Related Agencies Appropriations Act 1993). — I can’t recall USCIS proposing changes in indirect job creation methodologies. — In an IIUSA poll, 39 respondents agreed with a 10% direct jobs requirement. — Speakers at both House and Senate judiciary committee hearings questioned whether it’s fair to let EB-5 investors count all the jobs in a project when they provided only a small portion of funding needed for that project. I don’t resonate with this concern (after all, it’s common for a small piece of the capital stack to be a piece without which that whole project could not proceed), but apparently it’s fixed in the Congressional imagination as a concern. But I don’t know whether it’s in USCIS’s possible policy/regulation reach. — There have been suggestions in the past about getting other agencies (ie Department of Commerce) involved in vetting and/or setting rules for EB-5 economic analysis, but I haven’t heard this bruited recently. I wonder whether this is the indirect jobs issue currently on USCIS’s radar. The latest edition of the Regional Center Business Journal has a valuable article by Peter Joseph discussing the schedule between now and September 30, 2016 and what may happen in Congress during that time (page 19), and also a roundtable of EB-5 experts discussing the possibilities for changes through policy and regulation (p 38). 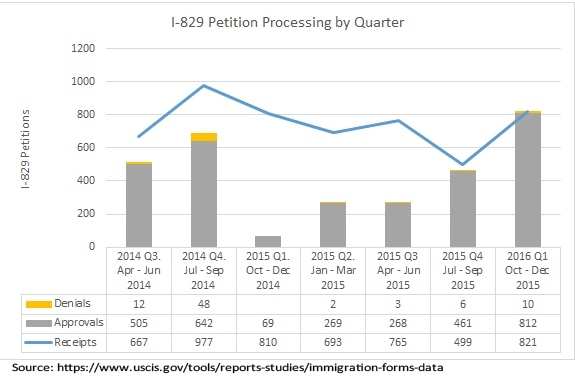 The USCIS Citizenship and Immigration Data page has been updated with data on I-526 and I-829 petition processing in the first quarter of fiscal year 2016 (aka October to December 2015). The numbers are not heartening. Investor Program Office petition processing volume peaked in April-June 2015, and progressively lost ground over the following quarters. In Q1 2016, IPO processed 355 more I-829 petitions but 933 fewer I-526s than in the previous quarter. The I-829 gains are nice, but then the I-829 backlog is only a dire 4,000+ petitions while the I-526 backlog is an extremely dire near-22,000 petitions. IPO cannot afford to be processing fewer and fewer I-526s, or fewer EB-5 petitions overall. The number of I-526 receipts is also striking. We expected the surge in July to September 2015, in advance of the possible September 30th Regional Center Program sunset date, but the numbers show that the surge continued through December. That’s two quarters in a row with over 6,000 I-526 filings each. The program can’t handle many quarters like that, considering that only about 10,000 EB-5 visas are available per year for investors plus family members (not to mention the fact that IPO has only managed to process about 3,000 I-526s a quarter at best). 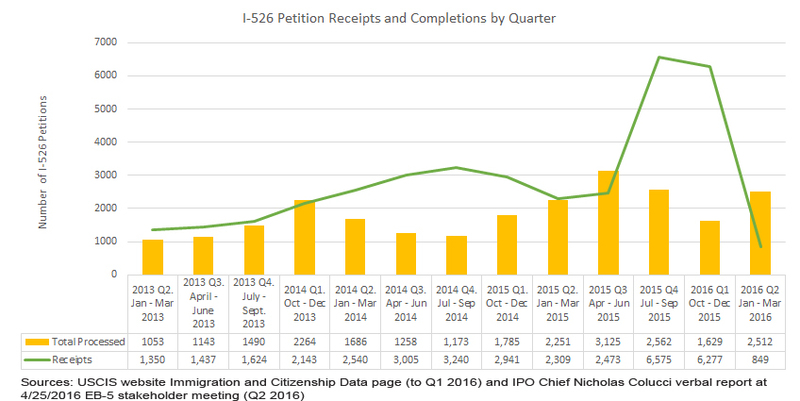 In addition to slowing I-526 processing over the course of the year, IPO got tougher, denying 8% of I-526 petitions processed in Q3 2015, 15% in Q4 2015, and 23% in Q1 2016. Additions to the USCIS Regional Center List, 03/01/2016 to 03/21/2016. The US Department of State has finally published Section V. of Report of the Visa Office 2015, so we now have figures by country for all EB-5 visas issued in FY2015. (Last December I reported numbers from Section VI of the report, which only reflects EB-5 visas issued at consulates.) Here is my updated summary table. Even as Representatives Goodlatte, Conyers, Issa, and Lofgren (who worked with Senators Leahy and Grassley on their legislation last year) were speaking in yesterday’s House EB-5 hearing about how they think EB-5 incentives are misused and need to be re-oriented, representatives Polis and Amodei introduced H.R.4530-EB-5 Integrity Act of 2016, a bill that proposes to keep current EB-5 incentives in place. I’ve added the bill to my comparison chart, but you don’t need to read it; H.R.4530 is a carbon copy of Senator Flake’s S.2415 (and FYI entirely different from the H.R. 616 American Entrepreneurship and Investment Act of 2015 introduced by Polis and Amodei last January). I don’t know whom to cheer in this legislative mix. The Grassley/Leahy camp bill included at least one provision that would touch and could hurt (sometimes even fatally) each segment of the regional center world, while the Flake/Polis camp bill is crafted to ensure that the current winners don’t get their boats rocked and keep winning, with TEA incentives and the investment amount the same and the kind of integrity measures that conveniently double as anti-competitive measures. Diversity in the regional center world can be a problem, because fragmented markets are hard to work with and small-scale players have a relative probability of being unprofessional if not rogue and causing trouble. On the other hand, diversity means that EB-5 is relatively likely to fund the kind of projects that Congressional representatives want to see to help justify the regional center program — the hotels in third tier cities, the logistics companies in blighted industrial areas, the affordable housing, the entertainment and agricultural projects in rural areas, and so on. If regional center investment becomes all small safe loans to luxury developments in gateway cities, then immigrant investors will benefit but the American public, media, and Congress may turn against what looks like essentially a low-bar green card purchase transaction plus jobs-neutral government subsidy for attractive projects that would’ve proceeded anyway, just more expensively without the green card incentive to lower capital costs. On the other hand, the cause of integrity would not be advanced by deciding to limit the regional center program to unattractive projects entirely dependent on hapless foreign investors, or providing too much leeway for issuers that lack resources to operate professionally. If I were called to testify, I don’t know what changes I’d suggest to maximize EB-5’s potential benefits and minimize risks. This quarter’s editions of the Regional Center Business Journal and EB-5 Investors Magazine (so far just out in paper form, but to be posted here soon) both have a number of great articles. In RCBJ, I particularly appreciated “What we Learn From SEC Investigation” by Ronald Fieldstone and Jay Rosen, who provide a comprehensive review of the types of violations that get investigated by the SEC, the specific activities that are focus of investigations, and the SEC investigation process from subpoena through discovery, deposition, negotiation and settlement. Lili Wang writes helpfully in RCBJ about the question we all ask “What Do Chinese Migration Agents Really Want?”, and EB-5 Investors Magazine also takes up this theme with two interesting migration agent interviews. Gregory White, Mark Katzoff and Angelo Paparelli authored an article for v.3.3 EB5 Investors Magazine (that I hope will soon be available online) on the important topic of “Avoiding the Inadvertent Investment Company.” The article describes how a regional center or issuer may avoid (and what will happen if it doesn’t avoid) being tagged as an investment company, including possible rescission, ineligibility to satisfy the EB-5 “at risk” capital rules and a duty to register as an investment advisor. EB5 Diligence also had a webinar this week on the topic Are Regional Centers Acting As Unregistered Investment Advisors? Another hot topic is the “rent-a-center” model for regional center investment, which has become increasingly popular and has also appeared in the cross-hairs of some legislative reform proposals. Rohit Kapuria has posted a thoughtful article Is the EB-5 Regional Center “Pure” Rental Model Sustainable?, and EB5 Projects will host a free webinar on 2/23 concerning Immigration & Securities Issues with Renting Buying & Selling an EB-5 Visa Regional Center. USCIS has updated the 2/3 EB-5 Stakeholder invitation page with copies of the written opening statements made by Nicholas Colucci, Julia Harrison, and Lori MacKenzie. Also FYI I keep a master directory of USCIS EB-5 stakeholder meetings and a handy searchable PDF compilation of all published meeting notes (for those times when you can remember USCIS discussing a topic but forget where and when). Not that we put much stock in IPO processing time averages (at least not without keeping a 10-month or so standard deviation in mind), but USCIS Processing Time Information has been updated as of 12/31/2016: 16 months for I-526, 16.2 months for I-829, and 8.5 months for I-924 (all up about 0.5 months from the previous report). Additions to the USCIS Regional Center List, 01/28/2016 to 2/10/2016. The Senate Judiciary Committee/Senator Grassley have titled next week’s hearing “The Failures and Future of the EB-5 Regional Center Program: Can it be Fixed?” Good heavens! No wonder journalists started calling me yesterday wondering what’s blowing up in EB-5, and disappointed to discover that this insider knows a thousand boring little problems but no big story of pervasive failure to justify such a hearing title. But tis the season for politics, and EB-5 can appear as a golden opportunity to bash immigration plus the wealthy plus real estate developers plus Commies plus New Yorkers all in one rabble-pleasing blow. And Regional Centers may just have to get in line with police officers and Muslim Americans as victims of our politicians’ inclination to profile entire communities based on a few isolated actors. If I were a typical regional center innocently engaged in unremarkable project finance, I’d be worried about a powerful Congressman asking “do you have a future and can you be fixed?” while under the impression that I’m failing and am inherently likely to be facilitating terrorist travel, economic espionage, money laundering, and investment fraud. Hopefully the hearing will call speakers who provide our leaders a more accurate impression of what’s actually going on in the regional center program. The hearing will stream live on the Senate Judiciary Committee website at 10 am EST on Tuesday Feb. 2. Meanwhile, USCIS continues to process EB-5 applications and petitions. The average posted I-526 processing time jumped to 15.5 months as of 11/30/2015 (up from 12.8 months reported as of 10/31). USCIS has also updated the regional center list, and posted a new PDF file that gives the identification number for each regional center. I can’t think how this could possibly help anyone (what we need, USCIS, is for you to please post the designation letters that show who’s behind these RCs and what you’ve approved them for), but the list with ID numbers is there FYI. Additions to the USCIS Regional Center List, 1/14/2016 to 01/28/2016.